Posted on July 16, 2017 July 15, 2017 by SherylPosted in FoodTagged cucumbers, recipe, tomato. Cucumbers have grown on me over the years. 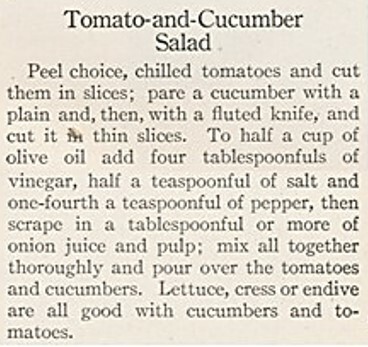 My grandmother, born in 1915, made a similar salad while I was growing up. It was always so refreshing. I look forward to making this recipe. I think it will be wonderful a Michigan summer night. It’s nice to hear that this recipe brought back some good memories. It’s a lovely salad and I think that you’ll enjoy it. How do you obtain onion juice? I just used a grater to grate a little onion – and then put both the resulting liquid and solids into the dressing. 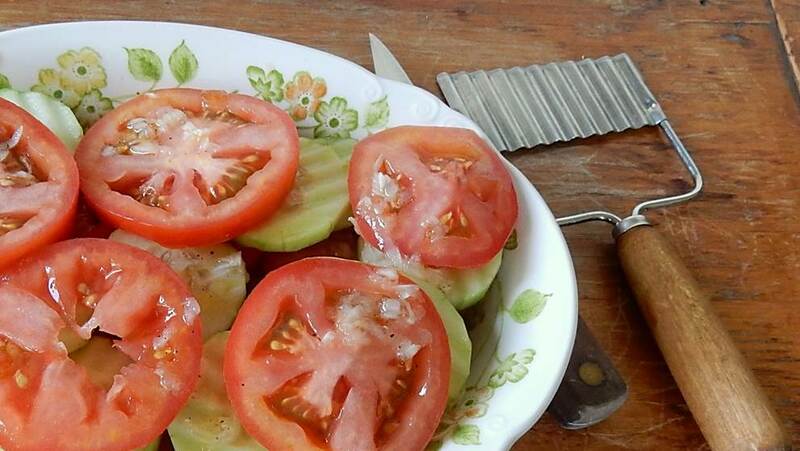 It is a wonderful summer salad, especially with fresh vegetables. I have started making my own salad dressings and really like homemade. There’s something special about homemade dressings – and many are so easy to make that there is no real need to buy bottled ones (though I must admit that I have several bottles of dressing in my refrigerator and often use them). Easy prep. Perfect for 110° days. Everybody enjoy. I made the salad without some of the ingredients and had left enough left over for sandwiches – bacon and lettuce tomato sandwiches. It nice to hear that you enjoyed this recipe – and your comment makes me hungry for bacon, lettuce, and tomato sandwiches. I’m going to have to make some very soon. Looks good! With hot weather we are having more salads. Had tomatoes & avocado salad similar to this but may try it with cucumbers. mmm. . . tomatoes and avocados sound good. Salads are perfect for hot weather. Your plate done up is beautiful! This is a very refreshing salad. Thank you! I was pleased with how the photo turned out. Oh my, I was surprised at the dressing recipe. I figured there would be Mayo and sugar involved. I’ve given up both Mayo and sugar so I can’t wait to try this!! Yum! Thank you. This dressing seems fairly healthy to me. The experts say that olive oil is good for us. I could eat this salad every day. It is so refreshing! It’s a perfect summer salad. It’s nice to hear that this blog brings back wonderful memories. I have so much fun doing this blog, and I’m fortunate to have wonderful readers like you. It’s wonderful have we’ve been able to get to know each other virtually over the past few years. and your grandmother, I still think of her whenever I am in the Turbotville area. It’s so nice to hear that you think of her. She was such a kind and humble person. I love what I’m doing with this blog now, but sometimes I miss the diary years. I wish that she’d kept the diary for more than four years. I can’t believe how fast the years flew by when I was doing posts from the diary. I think we all do too – but with marriage and raising a family we all know how time consuming that is. It would be interesting to read her thoughts on family life. Her legacy lives on because of you. That is a nice tribute to the person she was. Looks like a perfect summer salad to me! I agree! It’s perfect this time of year. A cool fresh veggie salad is always a tasty food to enjoy. Perfect for these dog days of Summer. It’s sure been hot lately. Cool foods are the best in this weather. A simple yet very tasty salad! I love that tasty dressing a lot! Yum! Simple foods often are the best. Since I stopped growing my own tomatoes I have not had much luck in finding REAL tasting tomatoes. I bet the salad would be very tasty with garden vegetables. I’ve noticed the same thing. Even at farmers’ markets, it seems like I can seldom find old-fashioned large, juicy, flavorful tomatoes. I guess that so many people are used to modern hard tomatoes that it doesn’t pay for the vendors to grow the best tomatoes. Yum! I also love fresh garden tomatoes and cucumbers. The best part of summer. I agree – produce fresh from the garden is the best part of summer. We eat like this all summer! That b/w photo in the original recipe looks like Oreo cookies, not tomatoes! Thanks again for posting these recipes. 🙂 I love your description of the old b/w photo. I hadn’t thought of it until you mentioned it, but you’re absolutely right, it looks like oreo cookies. That photo definitely has limitation.